The Steps to Expect in the Process of Domestic Adoption. How to know if adoption is right for you and everything to expect. Many people don’t fully understand just how much is involved in the domestic adoption process. Often times when we hear “adoption” we think “long wait” and that’s very true. The path to a baby joining the family of a hopeful adoptive parents is long. There are several steps involved along this path and each one has it’s own hurdles, hardships and waits. When we first started our adoption process we had no clue just how many steps it would include. I’m hoping by sharing what to expect in the adoption journey that hopeful adoptive parents will have a clear understanding of what lies ahead and that their friends and family will have knowledge of the process so they can offer support through each stage! Adoption is not a decision to be taken lightly. Typically one spouse feels that calling on their heart before the other spouse does. God put that desire within me before He did for my husband. I highly recommend waiting and praying rather than trying to persuade your spouse to jump on board. I’m so thankful I was patient and allowed my husband the time to pray and see where his heart was leading him. During the tougher phases of our journey, I knew he was just as “all in” as I was which was a huge peace of mind! When making the decision to adopt it’s also important to consider all the factors involved. Your current family situation (bio kids? extended family? ), living situation (are you settled in your home? career? ), large events in the future (a big wedding coming up? long distance travel plans?). It’s also important to consider what path you want to take in adoption. 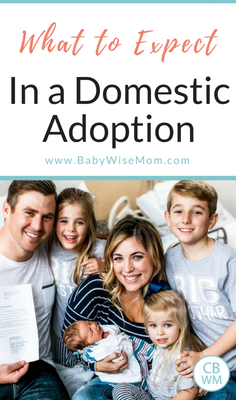 This post covers the domestic adoption of a newborn because that’s the path we chose but there are many different options when it comes to adoption and it’s wise to consider each one and figure out that best fit for you family. Adoption is expensive. Like crazy expensive. Go through your finances. Do you have funds you can access? Savings? Loan options? Be sure to check with your CPA regarding the tax adoption credit requirements too as this is a large credit that can really help offset the adoption costs. Also consider fundraising options. We did a t-shirt campaign, yard sale, and a puzzle fundraiser. All were successful and family and friends enjoyed the opportunity to help us! I was SO confused as to what to do first once we decided to adopt. Some people will say to go ahead and start the home study process, which is fine. But as someone who was CLUELESS about adoption I wanted to find someone who knew what to do and could help me throughout the entire process. We decided to go with a consultant (we used Christian Adoption Consultants) as I liked that our consultant had a ton of knowledge about adoption and the process, that she’d design our profile book for us, and that using a consultant would allow us to be in contact with multiple agencies and lawyers rather than just one. Many families decide to work with an agency but I have heard that it typically takes much longer to be matched and that there are often rules regarding being “stuck” with that agency. The consultant path was the best fit for us but be sure to explore all options. This is a good time to reach out to anyone else you know who has adopted before, ask questions! Join Facebook Groups! Do research to learn about what to expect in the months/years to come! There is no “best time” to announce your decision to adopt. We decided to announce our plans after we signed on to work with our consultant and as we were beginning the home study process. We knew we’d need help with childcare for our bio children while completing the home study and we knew we wanted as many prayers and as much support as possible throughout the entire adoption experience so we decided to announce pretty early on. We also have three bio children whom we wanted to be fully part of each stage and wanted them to be able to share in our experiences right from the start! I’ve heard of many couples who wait until they are matched to announce. Or even those who wait until a baby is in their arms to make it public. It’s a personal choice and one that is truly up to the hopeful adoptive parents to decide! Each state varies on their requirements for home study completion but most likely you’ll work with a social worker in your state to complete this step. The home study process can be a huge source of frustration. There are a TON of things to do, appointments to make, paper work to fill out, and hoops to jump through. It’s frustrating to have to “prove your worth” and can feel redundant. Take it slow. Work through it all at your own pace and don’t let it stress you out. Also do not overly fret over the home study visits. For our home study we were required to have an in home visit from the social worker. She was there to make sure our home was safe and that we’d be offering a healthy environment for a new baby. I cleaned my house from top to bottom and it was really unnecessary. It’s not a show to impress, it’s just a simple visit to make sure things are safe and that’s it! I did so much work and the whole thing was done in 30 min and she really only went in each room to check for a smoke detector ha! While working on the home study it’s also good to be putting together your profile book. Different agencies do things differently but in working with our consultant we gave her photos and information and she created a beautiful book to be able to submit to agencies and law offices when presenting to expectant mothers. Once you are home study approved then you move to the next stage of waiting and that is the wait to be matched! Again this stage can vary but for us we received emails of expectant mothers who our consultant thought would be a good fit for us. My husband and I reviewed the information together and decided if we wanted to submit our profile. If we did then we’d write a personal letter to that mother and send our profile book to the lawyer or agency she was working with. The expectant mother would then review all the profile books she’d receive and would select the best fit for her and move forward from there! This stage is a double wait stage. You spend time waiting for potential birth mothers to view and then spend time waiting to hear their decision. This is the most emotional rollercoaster phase of the process as it’s hard not to get super excited and hopeful each time you present and is heartbreaking when the expectant mother chooses another family! A home study is only valid for 1 year so when you reach month 10ish it’s wise to go ahead and re-do anything necessary in order to update your home study. I’ll keep it real: this was hard for me emotionally. We were on the verge of being a year out from our home study being approved and had to start doing everything again and it felt pointless when we were yet to be matched! I truly believe that the PERFECT match WILL happen for each hopeful adoptive family. We submitted to 7 birth moms. We received 7 nos. But that 8th? She was our YES and it couldn’t have been the more perfect fit. So many stars had to align just right and I wouldn’t change a single thing about our journey because it led us to Mama E and our baby boy! In our situation Mama E chose our book and then we had a phone call where we spoke to her and got to know each other a little better and then both told her lawyer that it was a “yes” for each of us. When we were officially matched is when we had to pretty quickly send ALL the funds. It’s so wise to have the money ready and waiting because when you need it, you need it QUICK! Every situation is different and unique. When starting the process we hoped we would have a semi-opened adoption relationship where we’d send photos but not really get to know the expectant mother personally or have a long term bond with her after placement. It was interesting because Mama E felt the same way. She too didn’t want any sort of relationship with the adoptive family. But then we got to know each other. During her pregnancy I’d call and we’d text and stay in contact. She ended up asking for me to come to her dr visits with her. She lives 2 hours from me so I’d go to every visit I could and we’d have lunch together and a bond naturally formed between us. I firmly believe this relationship benefits ALL parties involved. My husband and I had a peace of mind in knowing Mama E and felt more confident in her decision to place her son with us. Mama E knew us and felt more confident in her decision to have us raise her baby. And the baby benefited too, I believe our bond helped Mama E to get the best possible care for her child throughout her pregnancy. One thing that is pretty consistent among all adoptive newborn situations is to never trust the due date. We were originally told mid-November and then the due date was changed to mid-December and our baby was actually born on December 1st! The wait for that phone call that “it’s time” is very exciting and nervewracking. Depending on your specific situation you may or may not have the option to be present at the birth of the baby. We were able to actually be in the delivery room with Mama E (you can read my version of our son’s birth story here...and my husband’s perspective here). Be prepared that this will be a very tender time for everyone involved. It was beautiful and amazing to be there to see our son come into the world, but it was also heartbreaking to see Mama E go through that pain while knowing she wouldn’t be raising this sweet boy. Another one of the most difficult waits in the entire adoption experience is the waiting for the parental rights to be terminated. Again, this varies from state to state. In the state where our baby was born his birth mother had to wait until she was able to be discharged or 48 hours…whichever came first before she could sign. Some states require the biological mother to have a certain amount of time with the baby, some allow adoptive parents there from birth. In our situation our baby was able to room-in with us at the hospital. We kept continuous contact with his biological mother as she was just down the hall from us. This was such a tough time for me. I was holding this precious baby in my arms. That I’d prayed for. Waited for. Wanted so badly. Yet I was so scared to allow my heart to fall completely in love with him as I knew everything could change in a second. Once those rights were signed it was the biggest sigh of relief in the world!!! You can read about our time period of waiting for rights to be signed here, and when it was finished here. Depending on your state, after the parental rights are signed it’s all pretty much complete and over and is just waiting on final paperwork to make it official. I know some states have a grace period to allow the birth parents to change their mind after signing, but where our son was born that wasn’t an option. While waiting for finalization there are a couple of post placement visits with the social worker as part of the requirement to legally complete the adoption. Again, don’t overly stress about these visits. The social worker is simply looking to see that the baby is adjusting well, the family is adjusting well, and that it’s all a good fit. Even though our son was already ours, finalization day was still so magical and exciting. It’s the day that everything becomes official. All the waits and the adoption journey comes to an end! Again, it varies by state but ours was able to be over the phone with a judge who asked us very simple questions (all requiring just a yes or no answer) and then she granted us as our sons official parents forever and ever! Every moment of waiting. Every struggle. Every obstacle. Every single thing was worth it and all had to happen the exact way it did in order for our son to be OURS and I wouldn’t change a thing! 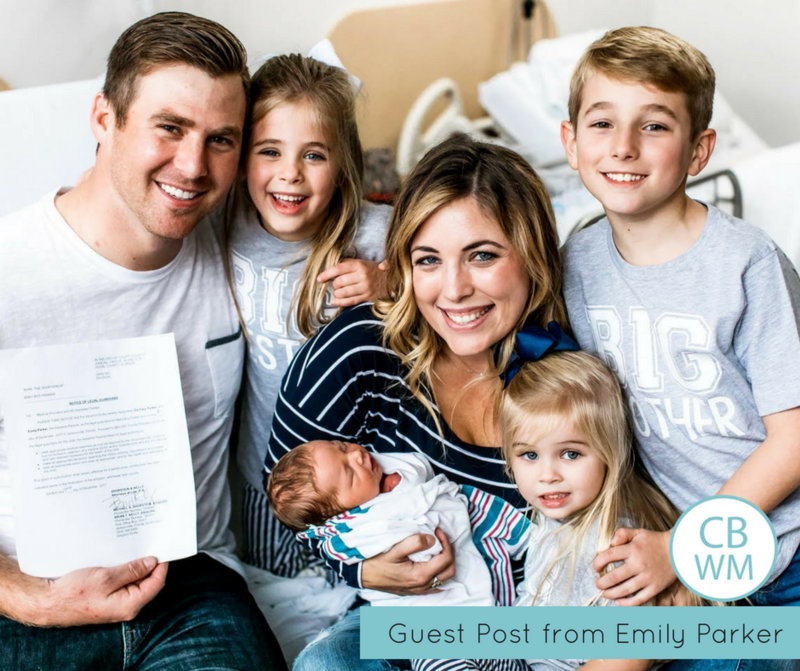 Emily is a mother of four who blogs over at The Journey of Parenthood. You can also follow along with her family adventures through Instagram! Previous Post Share Your Babywise Success!